By Kaitlin Williams, for the second season of the New Science Communicator series. In its simplest form, quantum entanglement is when two particles cannot be described individually without referencing the state of its partner particle. Quantum particles are different than classical particles in that they exist as a superposition of multiple states. Only when observed do they collapse to one of these states. When they are entangled, the superimposed states depend on the partner particle, so you can’t observe one particle without collapsing the state of the second particle. One of the most famous ways to experimentally observe quantum entanglement is using a Bell test, which is a way of observing the Bell inequality. Irish Physicist John Stewart Bell proposed the test in 1964, though it took nearly a decade before Stuart Freedman and John Clauser carried the experiment out in 1972. The Bell Test to was used examine the entangled state of two particles. The source in the centre of Figure 1 emits two entangled particles in opposite directions to detectors A (for Alice) and B (for Bob). Each particle has two observable properties, and Alice and Bob can choose to measure property 1 or property 2 of the particle. Let’s say Alice measures her particle first, measures property 1, and finds that it has value X. She also knows the description, or wavefunction, of the original source before the particles were emitted. This tells her how the two particles are intertwined, and so, Alice knows what the measurement of the same property on Bob’s particle is. But Bob hasn’t looked at his particle, so he has no idea what the detector’s measurement on his particle is. Alice calls Bob to say she knows what her particle is and therefore what Bob’s is, so Bob looks at the measurement and confirms that Alice is right about his particle’s state. Schematic of the system used to test Bell’s Inequality. Boxes A and B represent the two particles being observed, and boxes labelled “1” and “2” represent the two properties that can be measured for each particle. If the behaviour of entangled particles proved the Bell inequality to be true, then quantum particles can be described by local variables: some element outside the scope of the experiment that influences the results. The theory behind quantum mechanics will only hold if local variables don’t exist, which is why it’s so important that Bell tests must disprove Bell’s inequality. Thankfully, Freedman and Clauser did just that in their 1972 experiments. Their data, based on the angle between polarizers in front of the Alice and Bob detectors, fits a smooth curve with no outliers and clearly disproves Bell’s inequality. Quantum Theory is safe! But what if the two detectors were only picking up the particles exhibiting entanglement and not the ones that weren’t? The Bob particle would have to know that the Alice particle was measured and respond faster than light could travel from Alice to Bob. These unresolved uncertainties could be the effects of local variables that simply weren’t accounted for. Determining whether or not a Bell test experiment is valid requires eliminating local variables. Over the past 87 years, modified Bell experiments have taken place around the globe in an effort to eliminate as many local variables as possible. Incredibly sensitive detectors and modifications on Bell’s initial theory have both been used to ensure that a large samples of particles are examined to reduce the statistical errors in the data. Extremely fast detectors are used to measure the particles before any information could be transferred between them at the speed of light. However, one substantial issue has largely not been resolved: are the detector settings being influenced during the experiment? This is known as the freedom of choice loophole, and generally a random number generator is used to select between two detector settings to theoretically remove any influence from the experimenter. But how can we make sure the number generator isn’t itself influenced by the entangled particles? The answer may lie in the stars. This year, the Massachusetts Institute of Technology, alongside the University of Vienna and their collaborators, released research on a Bell test experiment they designed to eliminate the possibilities of unfair sampling, faster than light communication, and detector settings influencing the results of the experiment. To eliminate any influence from the detector settings, they used the incoming light from two distant stars as their random number generator. Two telescopes situated at the Alice and Bob detectors were trained on these stars and tasked with detecting the colour of the starlight. Depending on what that colour was, the detector setting would change. The stars were so distant that the starlight was emitted from the star around 600 years ago. Any ‘local variable’ influencing the experiment would also have to have been set 600 years ago across the galaxy, long before the time of the experiment. 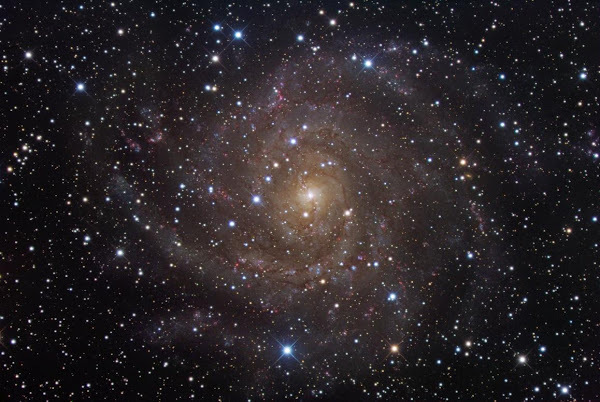 Using incredibly large stars millions of miles away to examine minuscule particles is an excellent example of the creativity used today to try and solve quantum theory. The starlight experiments highlight exactly how far the physics community has come from the origins of quantum theory, but also shows how far we still have to go to cover all possibilities of local variables. Although we can never completely disprove the freedom of choice loophole, this stellar approach has made the possibility of a local variable from detector settings seem skeptical at best. Make no mistake: much of quantum mechanics is still a mystery. Physicists have creatively used immense celestial objects to help describe quantum entanglement of the tiniest fundamental particles, which will lead to further innovative ways to create, test, and disprove quantum mechanics. Is quantum entanglement action at a distance? That’s yet to be seen. Is it spooky? Definitely. Guest Authors, New Science Communicators, Physics and Astronomy astronomy, bell test, bell's inequality, kaitlin williams, new science communicators, quantum mechanics, starlight. permalink. Could space travel hold the key to saving the earth? Keep your garden Canadian, eh?